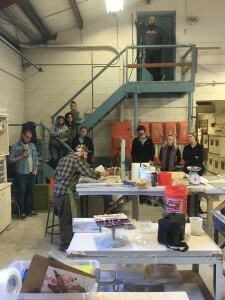 Israel Davis will present a workshop and demonstration of image transfer onto clay, Thursday, January 28, in the Ceramics area, Bureau of Mines Building #5, on UA campus. On Friday, January 29, at 10:00 a.m., Davis will talk about the process and his own work in 308 Garland Hall. The public is invited to both events. In describing Davis’ process of transfer a digital image onto clay, ceramics professor Matt Mitros noted that Davis creates an image using photoshop and other digital programs, makes a screen print and then transfers that image onto clay using slip, a suspension of clay in water. 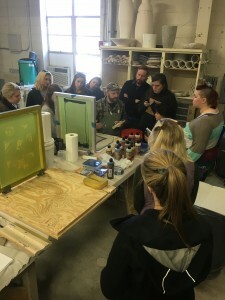 In the Thursday workshop, Davis will demonstrate his digital image creation technique, the screen printing on clay process and pressure casting. 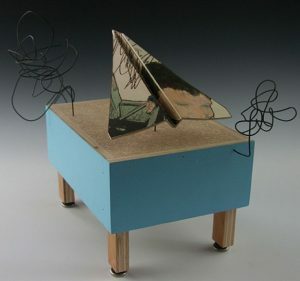 On Friday, Davis will speak about his own work at 10 a.m. and then continue with with workshop demonstrations. On both days in the afternoon, Davis will oversee UA art student art projects as well as visit graduate student studios to look at student art work. 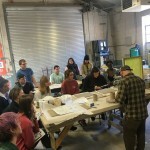 Israel Davis’ demonstration workshop and lecture is supported by the Ceramics and Printmaking areas and the Visiting Artists and Lecturers Committee of The University of Alabama Department of Art and Art History. For more information, contact Matt Mitros. Image credit above right: Hayden Davis Dreams Dreaming, mid-range slip-cast porcelain slab, hand-built digitally generated image, screen-print with underglazes, rebar tie wire, wood, 8 x 12 x 9 inches, 2013. Other images courtesy Matt Mitros.